When the Assyrians were carving out the world’s first true ‘super empire’ from the period of 10th century to 7th century BC, a wave of pastoral tribes from north of the Caspian Sea was busy settling in the eastern side of Zagros Mountains, in an expansive plateau that stretched all the way to western India. These were the semi-nomadic Indo-Iranian people who flocked to settled lands and even started out their own religious institutions with the ‘universal’ principles. One of such principles pertains to the prophet Zoroaster and his nigh monotheistic approach to religion – with the ‘head god’ attribution given to the supreme being of Ahura Mazda. Such evolving yet unrestricted religious maxims clearly contrasted with the Babylonian system where each city seemingly had an exclusive patron god with his/her own set of ‘godly’ powers. Guided by these newer religious conventions (that seemed to favor order, truth and the law or logic) and semi-nomadic cultural background, the tribes of Iran (still relatively independent from each other) did identify themselves as a separate super-entity who were different from the Babylonians settled in the resource-rich regions of Mesopotamia. And in the south of this land of Iran emerged a confederation of around 10 or 15 tribes, who collectively named their realm as Persia. The leading tribe among this burgeoning league was the Pasargadae – and their king always came from the Achaemenid clan. 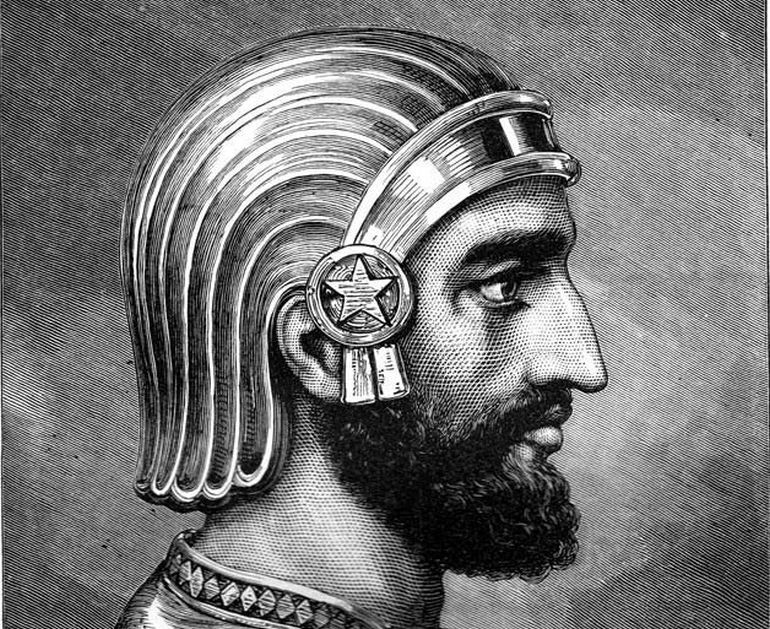 In 559 BC, a new leader was chosen: Cyrus II (‘the Great’); also known as Kurosh-e Bozorg (or Cyrus the Elder) in New Persian, the founder of the Achaemenid Persian Empire. The emergence of Cyrus II to power only came after he subdued the Medes, a super-tribe from Northern Iran that was initially stronger than its Persian counterpart. And after taking control of the entire realm of Iran (which will be called Persia from now), he declared himself the ‘Shah’ (or simply King) of Persia. Historically, this proved to be an incredibly momentous event in the region, which till then was a secondary realm to the likes of the fabulously rich Babylonians and the rigorously tough Assyrians. To that end, spurred by his recent successes, the ever-ambitious Cyrus consequently invested himself and his newly founded kingdom in ‘world’ conquering endeavors – with the first target being the Lydian Empire based in Asia Minor. Ruled by the legendary King Croesus (who was supposedly the richest man in the contemporary world, and also credited with issuing the first true gold coins), the Lydians controlled all of Anatolia west of the River Halys, except Lycia. In spite of such intimidating credentials, Croesus was defeated by carefully-crafted planning and ruses that seemingly went against the established military protocols of the ancient world. This was epitomized by an incident that followed an indecisive battle near the Halys. As per customs and the existing situation, after the strenuous battle, Croesus retired to his capital Sardis – in a bid to solidly his position and continue the fight next spring. But Cyrus took a gamble of a lifetime and followed Croesus all the way to Sardis. This audacious move was mirrored by the unusual battlefield tactic of using Arabian camels (dromedaries) – both of which took the Lydian king and his cavalry forces by surprise. Subsequently, the citadel of Sardis fell to the invading Persians. In any case, Croesus’ life was probably spared – a political and psychological ploy that became the personal trademark of Cyrus the Great. As a matter of fact, the victorious king developed a magnanimous reputation for sparing conquered rulers so that he could supposedly use their advice on how to govern their lands. This was complemented by Cyrus’ progressive attitude (or at least his ‘pretense’ of generosity) towards foreign cultures and religions, a crucial personality aspect that aided the Persians when they next faced the Babylonians. After defeating the Babylonian army in a few engagements, the Persian Empire army made its triumphant yet bloodless entry into the jewel of the ancient world, the city of Babylon – a task made easy by the enemy tyrant Nabonidus, who fled the capital. 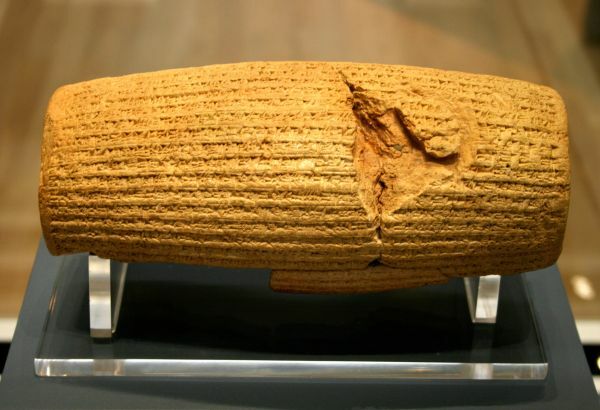 This incredible event was epitomized by the Cyrus cylinder, a Persian charter (made in 539 BC by Cyrus’ orders) that ‘sort of’ upheld the rights of the downtrodden – so much so that it is sometimes considered as the oldest known charter or symbol of universal human rights; though some scholars oppose this view – given how most ancients were unaware of the very concept of a ‘human right’. In any case, consisting of a baked clay tablet with inscriptions in the Akkadian language using a cuneiform script (pictured above), the contents of the charter tend to conform to three major points. These premises include – tolerance for all races, religions, and languages which are to be supervised by the ruling political entity; the allowance for slaves and deported people to return to their homelands; and the restoration of destroyed temples and religious buildings as causatum of religious freedom. Simply put, the often unfairly depicted Persians (especially in Hollywood) were the ones who came with such humanitarian (if not human rights) declarations, as opposed to the Ancient Greeks. 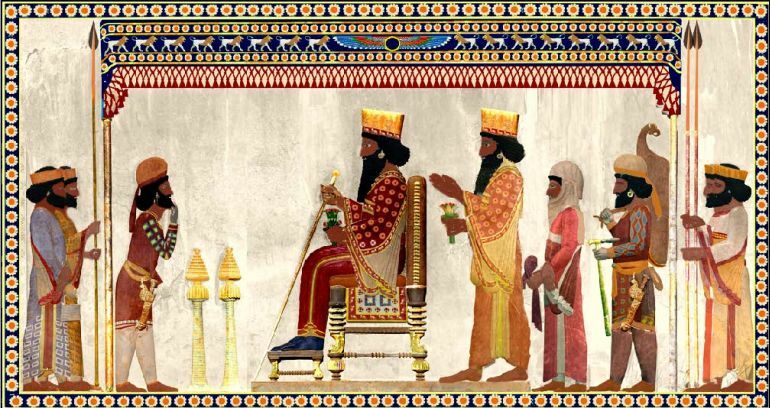 Post 6th century BC, the Achaemenid Persian Empire society can be categorized as ‘feudal’, with the burgeoning population inside the core lands of the empire being roughly divided into three classes – the nobility (azada), the bondsmen (bandaka) and the slaves (mariaka). As Prof. Nick Secunda explained (in his book The Persian Army 560–330 BC), interestingly all of these classes were officially the ‘bondsmen’ of the Great King, but the scope of hierarchical servitude among the king and his nobles only existed in concept. In other words, the power of the king was not absolute – and as such, he had to rely on the support of the Persian aristocracy. In the initial days of the empire, such arrangements were practical enough for the ruling monarch. This was because the Persian (and Medes) nobility had a long tradition of maintaining their tribe-inspired independence and thus were quick to take slight (and even incite revolts) from any intrusive political policy of the ruler. As we mentioned before, according to Herodotus, the Persian adult (presumably from the elite section of the society) was liable to be militarily trained until the age of 20. Strabo, however, puts the figure of military training and service until the age of 24, and the number might have related to any Persian man irrespective of his class. He further mentions how groups of such 50 men were often commanded by a chosen son of a noble. And, even after they had served in the so-called National Army of the Achaemenid Persian Empire, they were probably liable to be conscripted till the age of 50. Now, in terms of the total number of soldiers in this ‘National Army’, Xenophon vaguely provides us with a figure of 120,000 Persians. 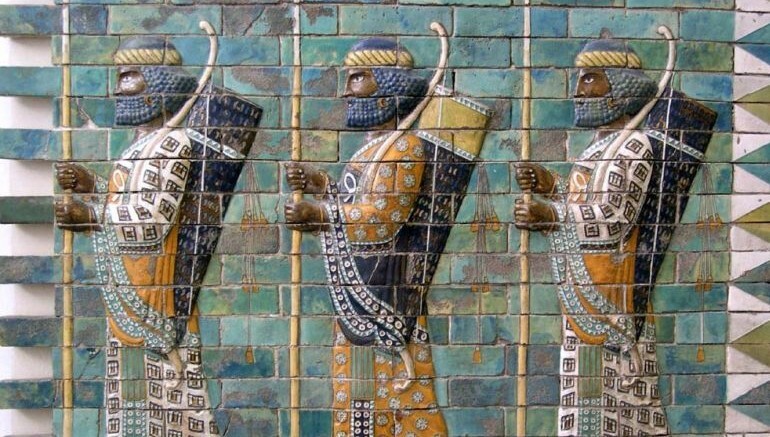 Interestingly, as opposed to the Greeks before the 4th century BC, ancient sources mention how the Persian army seemingly maintained its uniformed appearance through near-identical regimental dresses – a system which was unique in the ancient times. This might have been the outcome of the centralized nature of the army organization directly influenced by its noble commanders and the king (while Greek armies tended to be inspired by their individual poleis). According to Xenophon, Cyrus made a habit of gifting cloaks to his Persian nobles and even lower-ranked soldiers. 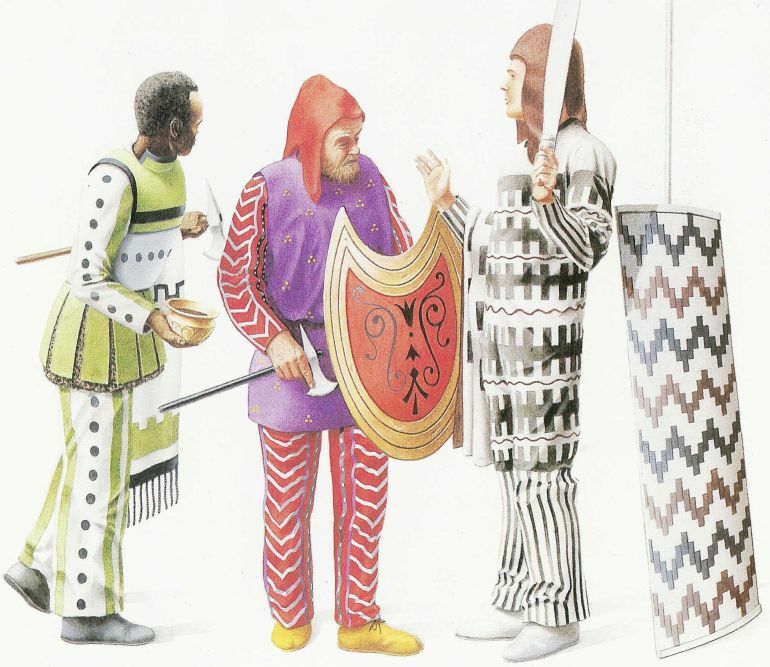 For example, the finest attires were given to the elites, while other cloaks (still ostentatious) with hues ranging from purple, crimson to ‘nightshade’ were distributed among the remaining officers of the army. Such ‘cloaks’ could have pertained to particular uniforms, and as such even Plutarch mentioned how the royal couriers of the Achaemenid Empire had to dress in specific attires befitting their high ranks. …a body of picked Persians under the leadership of Hydarnes, the son of Hydarnes. This corps was known as the Immortals, because it was invariably kept up to strength; if a man was killed or fell sick, the vacancy he left was at once filled, so that the total strength of the corps was never less – and never more – than ten thousand. Of all the troops in Persian army, the native Persians were not only the best but also the most magnificently equipped; their dress and armor I have mentioned already, but I should add that every man glittered with the gold which he carried about his person in unlimited quantity. They were accompanied, moreover, by covered carriages full of their women and servants, all elaborately fitted out. Special food, separate from that of the rest of the army, was brought along for them on dromedaries and mules. The dress of these troops consisted of the tiara, or soft felt cap, embroidered tunic with sleeves, a coat of mail looking like the scales of a fish, and trousers; for arms they carried light wicker shields, quivers slung below them, short spears, powerful bows with cane arrows, and short swords swinging from belts beside the right thigh. As can be comprehended from such accounts, the Persian Immortals were probably very different from the oddly ‘dark’ manner in which they were depicted in the movie 300. As a matter of fact, such elite divisions tended to flaunt their vibrant and ritzy uniforms and armaments – as is evident from their accounts of carrying spears with golden pomegranates, silver pomegranates, and even golden apples. The latter mentioned spears were carried by the king’s own bodyguard unit of 1,000 men – known as arstibara, but nicknamed as the ‘Applebearers’. 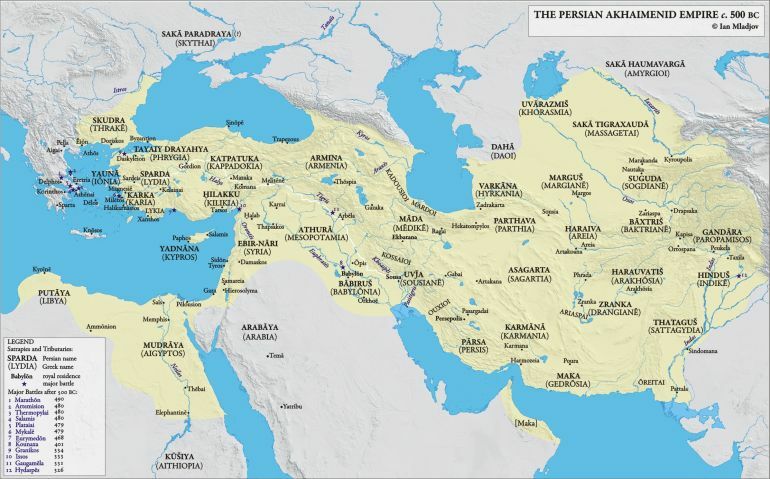 At its greatest extent, the Achaemenid Persian Empire stretched from Anatolia and Egypt across western Asia to the borders of northern India and Central Asia. The addition of Egypt to this burgeoning realm was achieved by Cambyses II, the son of Cyrus the Great – who defeated the native Egyptian forces at the Battle of Pelusium (in 525 BC) by apparently using psychological tactics that involved confusing the enemy with sacred ‘cat’ motifs on the battlefield! However, beyond just conquering new lands, the Persians also strengthened their hold on the territories via ‘public’ projects that improved communications over long distances. One good example of such a system relates to the construction of roads that connected important centers like Sardis (in Asia Minor), Ecbatana (in western Iran), Babylon (in Mesopotamia) and Persepolis (in southern Iran). These roads were primarily used by soldiers and royal couriers, and as such were even interspersed by government-maintained way-stations and resting inns. Moreover, the improvement of the empire’s inter-connectivity also favored the large trade networks that crisscrossed the length and breadth of the expanding realm. Such infrastructural endeavors were complemented by a complex bureaucratic scope that was used for administering the provinces (satrapies). To that end, the king and his supporting staff decided on the revenues expected from each satrapy (that mainly depended on its resources, population and relative geographical position). Moreover, members of the royal court and other important officials were granted food and other provisions from strategically supplied royal storehouses. By the time of Darius, such officials also discreetly included imperial spies known as the ‘king’s ears’. They were responsible for secretly keeping tabs on the provincial governors and military commanders, and reported back to Darius through the aforementioned postal service. 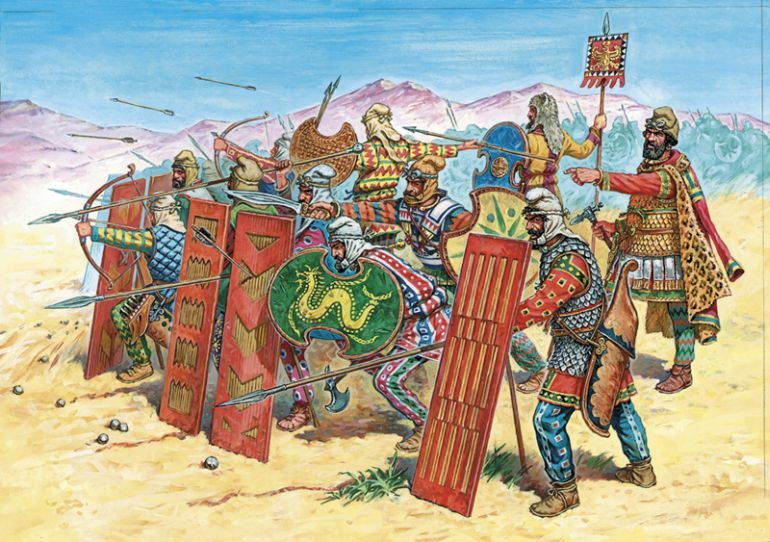 The Achaemenid Persian Empire can be credited for the development of organized cavalry forces that were tactically used on the battlefield along with other mixed forces like Sparabara (archers with large shields) and Takabara (heavy peltasts). 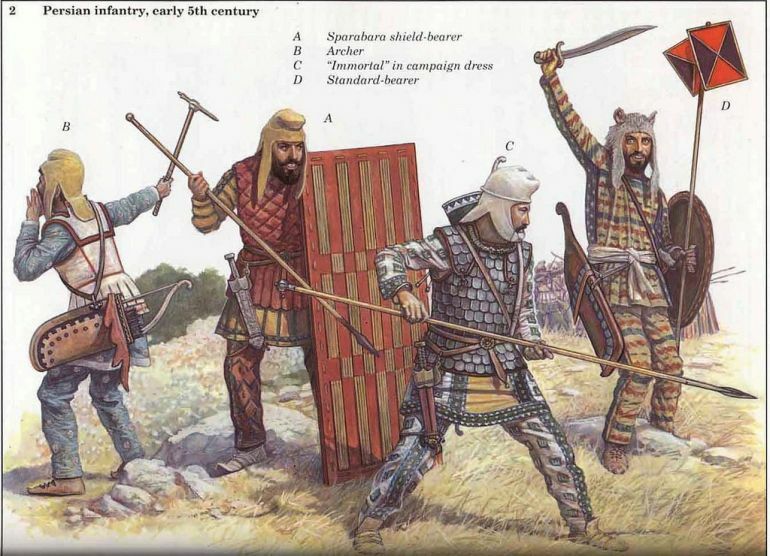 Seemingly inspired by the neighboring Sakas (many of whom were later used as mercenaries), some of the native Persians adopted formations of shielded cavalrymen who carried smaller, lighter versions of the spara (shield). A Persian document dating from 421 BC also mentions some other equipment of the cavalrymen, and this list included items like – a horse harness, a helmet, a leather cuirass, shield, arrows, two spears and some ration money. Intriguingly enough, the latter half of the 5th century BC also coincided with the rise of the shock cavalry that sort of mirrored the knightly class of Medieval Europe. Such heavily armored regiments (called the Persian Cuirassiers by Xenophon) were usually furnished by the rich Persian nobility in times of the disparate civil wars and clashes that frequently plagued the empire. And they were supposedly used on the battlefield as armored ‘battering rams’ that smashed through the enemy ranks in their column-like formations. Furthermore, there are also literary sources (like the Persika) that mention how these elite cavalrymen sometimes took part in joust-like duels that usually pitted the commanders (or kings) of the opposing forces against each other. Such personal duels possibly involved the use of arms like the palta, a type of specialized fighting spear made of cornel wood. While we have talked at length about the national conscripts and cavalry forces of the Achaemenid Persian empire, the trend of employing foreigners into the army was also on the rise even during the reign of Cyrus. And by the time of Darius the Great, the conscription of foreign mercenaries almost became a centralized system. This was due to the incorporation of various ‘fringe’ territories into the Persian empire, especially relating to the Saka tribes of Central Asia and the Indians along the borders of river Indus. It should be also noted that both of these cultures additionally brought forth new and interesting military ideas that were quickly adopted by the Persians. But the real extent and influence of the Achaemenid Persian Empire were grandly demonstrated during the invasion of Greece by the ‘multi-cultural’ forces of Xerxes. In that regard, a group of Athenian vases also showcase black soldiers in Persian panoply, and these were probably depictions of the Ethiopian marines who disembarked and fought in the Battle of Salamis and possibly even in the Battle of Plataea. 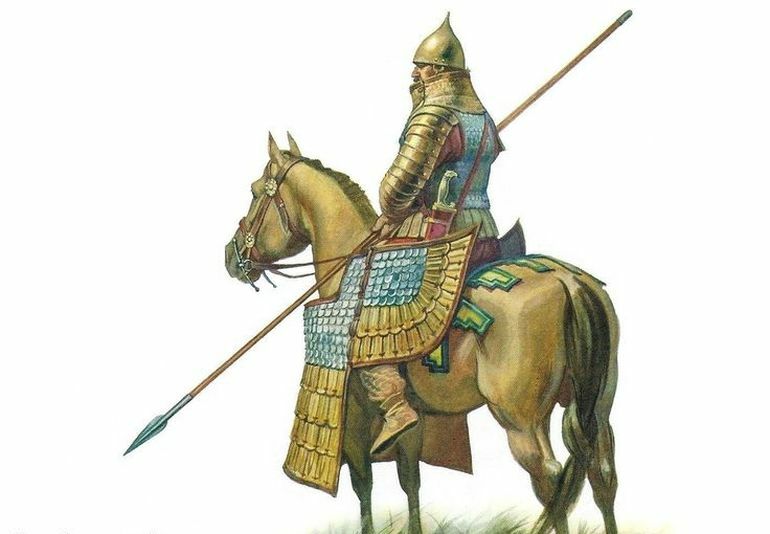 Such forces consisting of Sakas (Scythians), Medes, Hycarnians, Bactrians, Indians, Egyptians, and Ethiopians were also accompanied by lesser-known factions, like the Sagartians who were Iranian nomads that fought as cavalrymen with lassos and battle-axes. But when it came to the west, Greece itself was the greatest source of mercenaries for the Persian empire. Interestingly, the geographical aspect of Greece played a crucial role in establishing the realm as a major pool of mercenaries. This is due to the rugged terrain of many of the Greek lands that mostly allowed animal husbandry as the primary form of economy. Such pastoral tendencies (as opposed to large-scale agriculture) could also be managed by the womenfolk and the old people, and thus ‘freed’ many men to take part in military activities beyond their borders. For example, more than half of the famed ‘ten thousand’ Greeks mercenaries (mentioned in Xenophon’s Anabasis) apparently came from hilly areas such as Arcadia and Achaea. There are also shreds of evidence of the so-called military settlements within the Achaemenid empire where ‘high-value’ mercenaries and Persian war-veterans (kardaka) were encouraged to settle by exempting them from taxes. These special villages and towns were usually established in strategic areas – so as to mitigate the threat of local revolts and unrest. Once again reverting to the movie 300, the film portrays Xerxes (son of Darius) as a decadent fool with a god complex who invaded Greece on almost a whim. Now historically, the opposite of this scenario was quite true. 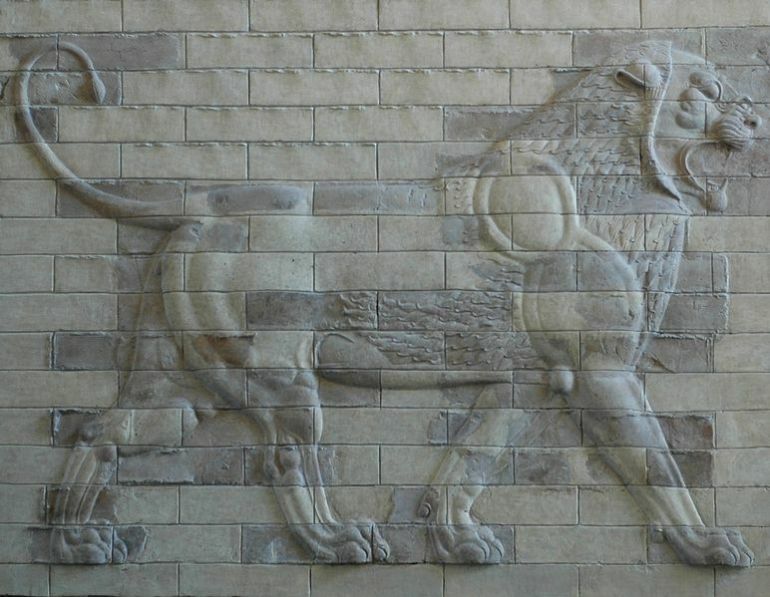 While Xerxes did carry himself more loftily than his predecessors (after all, he was in the royal line that boasted names like Cyrus and Darius), the Achaemenid Persian Empire that Xerxes inherited was beset by rebellions on all corners. These chaotic times demanded rigorous measures, and Xerxes’ reactions to such problems proved his practical nature (as opposed to decadence and cultural jingoism). For example, while previous Persian rulers grandiosely identified themselves as the chosen of Marduk (a Babylonian god), Xerxes promptly destroyed the deity’s solid gold statue (that was supposedly taller than the combined height of three men) in a bid to fill up the royal exchequer. This desperate action was taken in reaction to riots fermenting inside the great city of Babylon. However, Xerxes’ fall into excess and degeneracy came after the defeats suffered at the hands of the Greeks in 480 BC. Severely affected and even disgraced by the setbacks in his European campaign, especially after the Battle of Salamis, Xerxes came back to Asia and subsequently ‘retreated’ into the luxury of his court and harem. This trend of Achaemenid Persian Empire rulers being isolated in their lavish palaces, driven by decadent pleasures, court intrigues, and corrupt officials, continued for almost 200 years – thus leading to the rise of the power of provincial governors (satraps). And, as the Persian empire gradually degenerated into a weave of decentralized, autonomous zones with their unique cultural fronts, the time became ripe for a Macedon prince named Alexander, the greatest military commander of his age, to launch a spectacular invasion from across Europe. By the latter half of 4th century BC, the Greeks city-states themselves were going through periods of political turmoil and armed clashes. One of the effects of these tumultuous times was the adoption of newer military reforms that sort of phased out the heavy hoplites in favor of the epilektoi (picked troops). 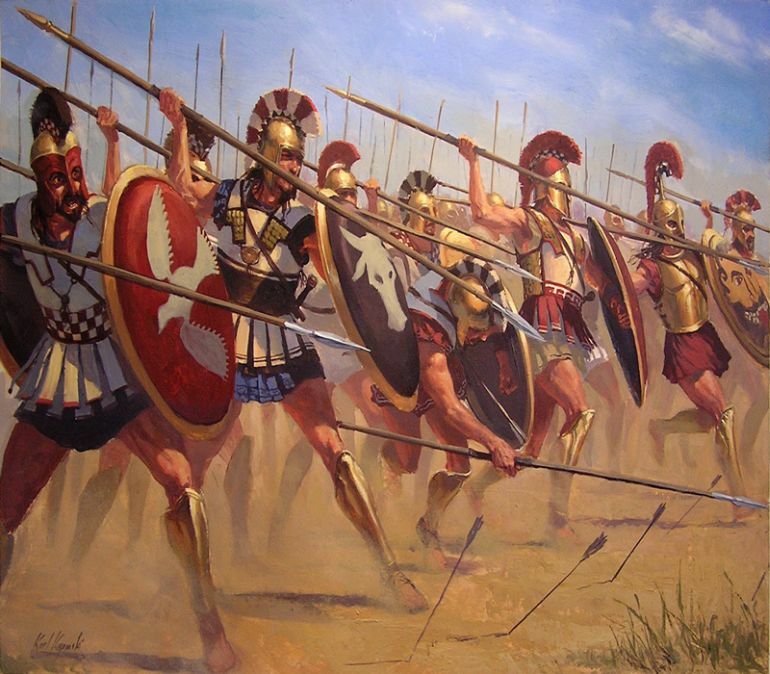 Unlike hoplites, however, these epilektoi had to be paid on a regular basis. Unfortunately, the Greek fiscal reforms didn’t keep with such measures, and soon many of the city-states found themselves in debt and yet ‘burdened’ with able-bodied soldiers of the highly-trained epilektoi. On the other side of the Aegean, a rebel Persian satrap named Artabazus was desperately in need of quality troops, and he had the money to spent on such ritzy military endeavors. Suffice it to say, a mutually beneficial agreement was soon drawn up where entire contingents of the Greek armies were loaned to Persian commanders – with lump-sum amounts being directly paid to the city-state instead of individual compensations. Many of these epilektoi companies fought deep inside the territories of the Persian empire – and some of them even took the service of the Achaemenid emperor. 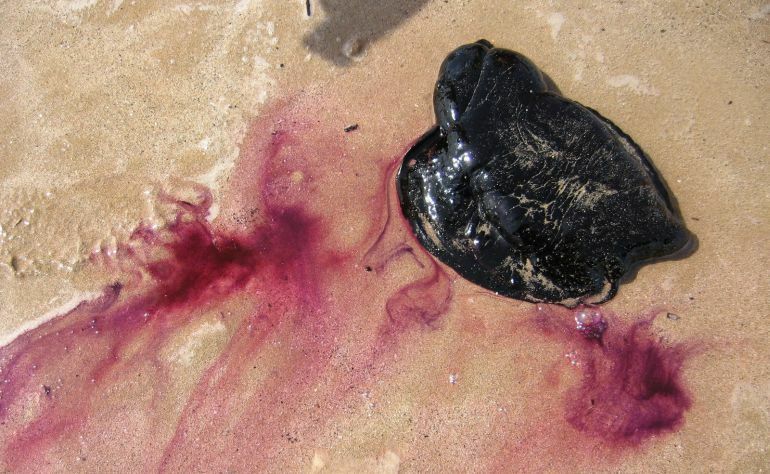 During ancient times, one of the most expensive materials in terms of both rarity and monetary value pertained to the ‘sea purple’ (also known as Tyrian red), a bromine-containing reddish-purple natural dye obtained from the murex shells. In fact, the renown of such ‘pure’ murex-obtained dyes was so widespread, especially among the royalty, nobles and rich merchants, that even other cheaper alternatives with the purplish hue were costly beyond the reach of common folk. This opulent nature value and status associated with these dyes inspired many Persian Empire royals to hoard purple-tinted clothes that were given as gifts to higher ranked officials. Even Alexander the Great came across a huge stash of the purple-dyed clothes that were secretly enclosed inside the Royal Treasury at Susa (in the western part of Persia). According to Plutarch, the total weight of this particularly expensive hoard was around 5,000 talents (or roughly 288,500 lbs, if measured in Attic talents) – and the dye still maintained its rich color after 190 years of storage. Unfortunately for Alexander, he soon ran out the ‘purple stash’ after deciding to gift every one of his Companions with a sea purple cloak.